Celebrate Summer at American Girl® Stores Nationwide | Mattel Inc.
MIDDLETON, Wis.--(BUSINESS WIRE)-- School's out for the summer and American Girl—one of the country's top experiential retail and tourist destinations—is the place for girls and their families to get away for a fun-filled summer vacation. 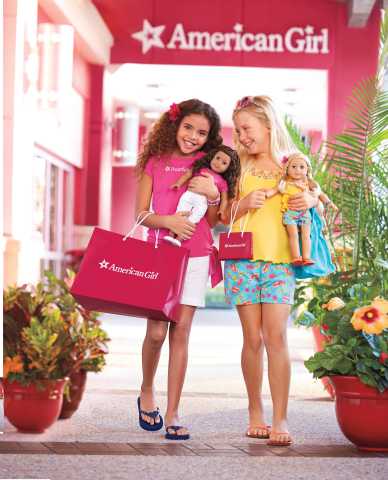 From May 22 through August 27, American Girl's 16 store locations nationwide will host a variety of exclusive, family-friendly events, plus an array of tropical-themed activities and experiences designed to help girls create unforgettable memories all season long. 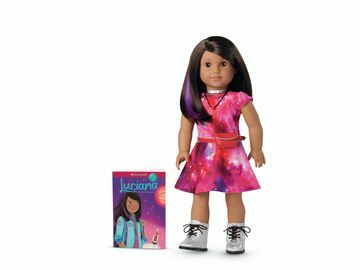 Isabelle Dances into the Spotlight Movie-Viewing Event―This July, American Girl is hosting two store premieres in one incredible event. Guests can be among the first to see the new Girl of the Year® movie, Isabelle Dances into the Spotlight, together with the "Isabelle's Dance Jam" video, featuring real girls performing a dance inspired by the movie. Beaches Resorts "Family Tropical Getaway" Sweepstakes―American Girl has partnered with Beaches Resorts and Delta Vacations® on a fabulous tropical getaway sweepstakes available exclusively at American Girl stores. Retail guests can enter for a chance to win a 4-day/3-night Luxury Included® Family Vacation to Beaches Turks & Caicos Resort Villages & Spa including round-trip airfare provided by Delta Vacations. Special Events—Girls can bask in the fun at the stores' exclusive Summer Fun Celebration, where they'll enjoy an island-inspired meal, take part in colorful, tropical-themed activities, make a mini beach tote for their dolls, and take home an American Girl book and a set of Crayola® Fabric Markers as a keepsake of their special day. Beyond Events & Activities―Visitors can also discover other store-only products and experiences throughout the summer. Girls can see the Beach Cabana Set for My American Girl dolls, enjoy the Summer Fun smoothie available at the stores' in-house restaurant, and get their dolls' hair styled in the Tropical Twist Bun in the Doll Hair Salon. And, for girls who love to curl up with a few good books during their school break, American Girl is hosting its third annual Read-a-palooza summer reading program. At American Girl retail stores, guests can explore the on-site bookstore filled floor-to-ceiling with compelling historical and contemporary fiction and engaging Advice & Activity books. 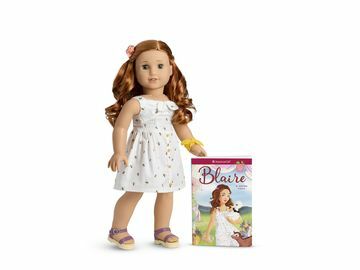 Other book-related in-store activities include author appearances by American Girl's beloved authors, a free Summer Reading Bookmark craft, and activities inspired by American Girl's popular historical and Girl of the Year characters. To coincide with the Read-a-palooza retail events, American Girl is once again partnering with Save the Children in support of their U.S. literacy program. From May 1 through August 27, 2014, $1 of every book purchased through American Girl channels (up to a maximum of $100,000) will support Save the Children's efforts to raise literacy rates in impoverished communities by providing basic education and equipping schools and teachers with reading materials. American Girl is a premium brand for girls and a wholly owned subsidiary of Mattel, Inc. (NASDAQ:MAT, www.mattel.com), the world's leading toy company. Since its inception in 1986, American Girl has been devoted to celebrating girls ages 3 to 12 through age-appropriate, high-quality dolls and accessories, books, clothes, movies, and unforgettable experiences. Best-selling lines include My American Girl®, Girl of the Year®, Bitty Baby®, and its classic historical characters. Headquartered in Middleton, WI, the company sells products exclusively through its award-winning catalogue, on americangirl.com, and in its experiential retail stores. By inspiring girls to be their best, American Girl has earned the loyalty of millions of girls and the praise and trust of parents and educators. To learn more about American Girl or request a free catalogue, call 1-800-845-0005 or visit www.americangirl.com, www.facebook.com/americangirl, or www.twitter.com/american_girl.